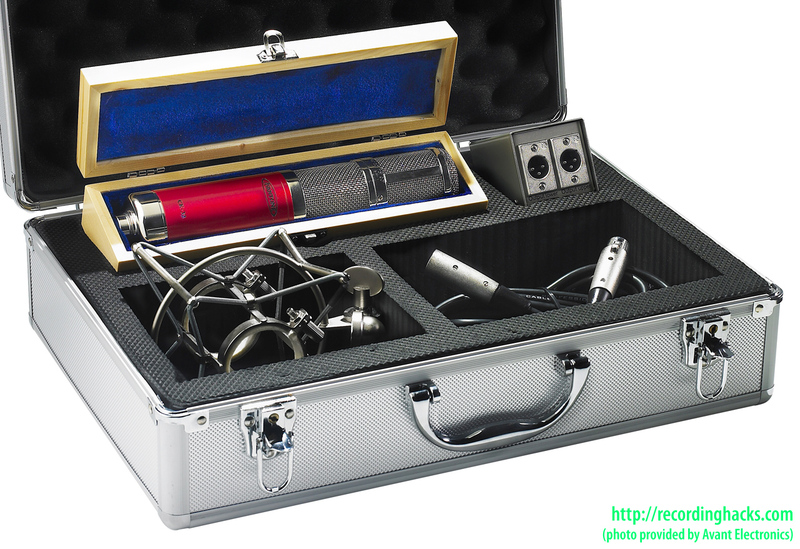 The CK-33 is a stereo FET condenser microphone. Two large-diaphragm 32mm capsules are mounted vertically; the top one swivels 90 degrees relative to the bottom. As are all the mics in Avant’s “C” series, the CK-33 body is painted metallic red (“Cabernet”), with polished nickel trim and plated steel grilles. 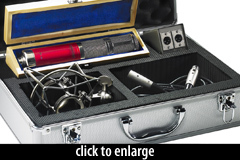 The CK-33 includes a padded wooden storage box for the mic, a signal-splitter box (5-pin XLRF to two 3-pin XLRM), an elastic shockmount, and a 5-pin (stereo) mic cable, all packaged into a foam-lined flight case. It is covered by a 5-year warranty. The Avantone Pro CK-33 is also known as: CK33.